i have been enjoying the company of mountain trails for the better part of the last 12 years. my first proper overnight mountain camping trip happened in february 2003, about two weeks before i became a full-fledged lawyer, when i wandered into a room and ended up days later on the summit of mt. pulag, and i have neither regretted the sunburn, the sore back, the dead toenails, nor lamented the expense, and the pile of laundry. i am drawn to hardship and escape in probably the same way that some people are lured by the comfortable and the familiar. in those 12 years, i have met, suffered, and wandered with a diverse group of people whose backgrounds span the entire spectrum of personalities, and yet they share one common trait: the propensity to misuse certain words. it is not a question of whether these terms take on a different meaning that is specific to the sport they've taken up. on the contrary, they have a very precise definition within the context of the activity, but due to constant misuse, they have wrongly passed into the shared vocabulary of people who worship at the shrine of mountains. i would like to point them out, not so much because i want to change the way things are said (i don't think i could ever achieve that), but in order to come into an understanding of how things are evolving, and why perhaps that evolution should be reversed. at the charles darwin walk in the blue mountains of australia. did charles darwin fancy himself a mountaineer? these terms are loosely used to refer to the sport and the athlete. though not completely incorrect, it is not very accurate either in describing the specific activity that most pinoy 'mountaineers' are involved in (the single quotation marks show my unease in using the term, as i would much prefer to call myself a person who goes outdoors, or someone who camps under the stars, away from civilization). 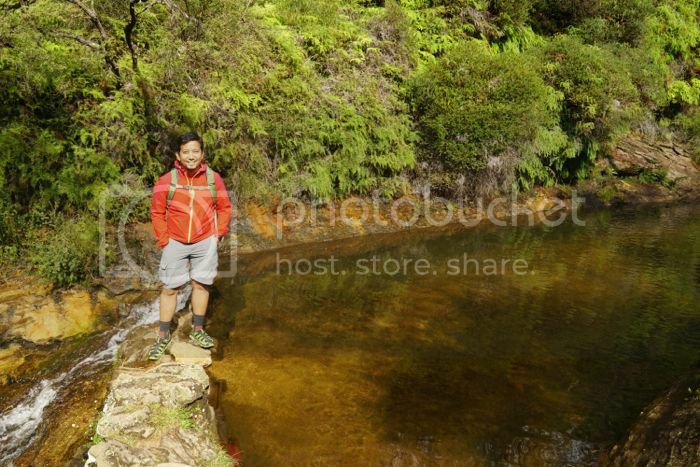 mountaineering is a broad concept that includes a variety of disciplines, from alpine climbing to bushwalking. the reason i am hesitant to use this term is that i could not possibly align myself with those who risk life and sanity for the salutary glory of reaching mt. everest's peak. i am not in that same league, but what i do has a few similarities, mainly that i put one foot ahead of the other, and in the process aim to reach a place higher than where i originally came from. besides, wikipedia's definition is actually restrictive, since it equates mountaineering with alpinism, making alpine climbers the only mountaineers. other definitions i found online are more inclusive, but with every single person who has ever been on a trail calling himself or herself a mountaineer, i wonder whether filipinos have diminished the word, which really ought to be a title deserving of more credibility. the paragraph above might actually surprise the typical reader. yes, mountaineering is a sport, and hence, mountaineers are athletes. 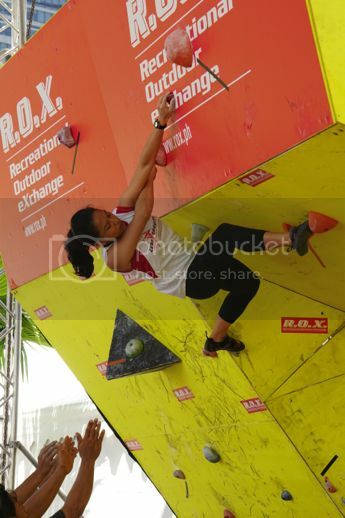 the sport is regulated by the international climbing and mountaineering federation, a body that is recognized by the international olympic committee. being a sport, mountaineers engage in competition. and there are standards. although i have just said that i have qualms about describing what i do as a sport comparable to what many amazing human beings have done at altitudes where most human beings cannot survive, i think what's important is to distinguish myself from travellers or tourists who casually take strolls along paved roads to reach manicured viewdecks, desire to be away from the noise but unwilling to give up certain conveniences. my conclusion is this: be honest about the modesty of your aspirations, and why be vague and general, when you can be more specific and precise? would you invite these guys to a climb? i am reluctant to include this here. i am actually guilty of misappropriating 'climb' for an activity that can be more accurately described as a hike or a trek. again, this is just an example of how loosely we tend to use terms which otherwise has very limited definitions in the context of the sport that we all participate in. the generic definition of "climb" could be any of the following: as a noun, it means "an upward slope or grade" or "an event that involves rising to a higher point" and as a verb it means going "upward with gradual or continuous progress". that rather accurately describes what i do. but climbing as a branch of mountaineering is a bit more specific: it really either means indoor wall climbing, rock climbing, or bouldering. i include this here because i thought about strange scenarios when a boulderer and a hiker, both claiming to be mountaineers, meet each other for the first time, and invite one another for a climb. did either of them have a different idea of what activity they were going to do? would both be bringing the same equipment? 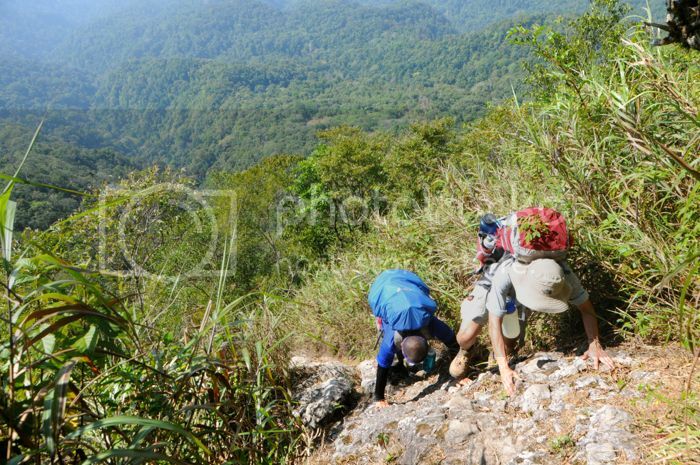 the trouble with basic mountaineering courses in the philippines is the lack of a fixed and rigid standard that is commonly shared by mountaineering clubs and mountaineering federations. anyone who teaches a subject or topic under this still undefined area of knowledge does so on the basis of experience, instead of research. while experience is still the best teacher, experience does not make for consistent teaching. that BMC lecturers are neither vetted nor regulated by any governing body is not an excuse to be sloppy in our use of terms, to the point that we pass on our mistakes to anyone eager to learn. i find this pernicious cycle no more present than in our use of the word "tadpole" to refer to a type of modified dome, front-entry tent. 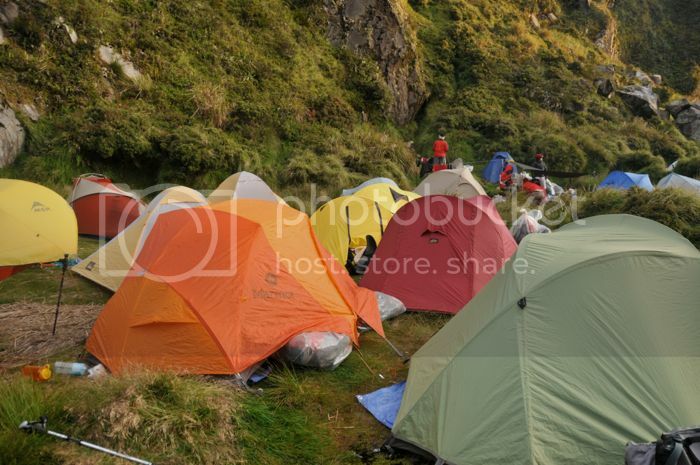 this misuse is of course attributable to the immense popularity of the TNF tadpole 23, an iconic tent consisting of 3 poles, a generous vestibule, a huge door, and a shape that tapers at the end. the design is sleek and aerodynamic, and was quickly copied by local tent manufacturers, each with their own versions of the tadpole shape. but the problem now is that the north face has decided to revise an icon. although its general shape is the same, the pole configuration is very different. 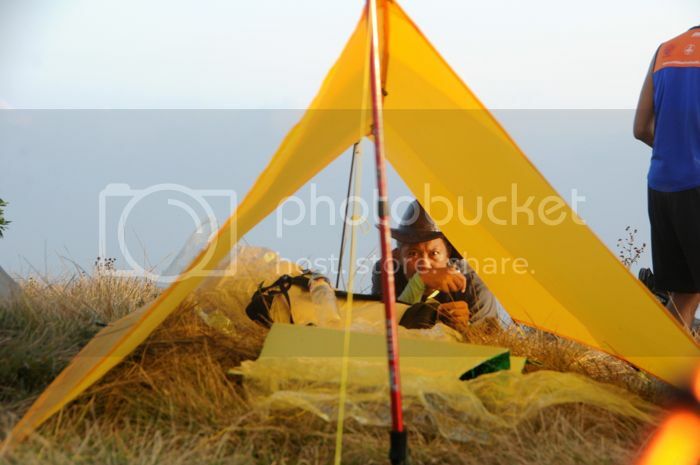 will we call the new TNF tadpole 23 a non-tadpole tent because of this? just to be clear: tadpole is not a type of tent. dome, modified dome, hoop, A-type: those are tent designs. 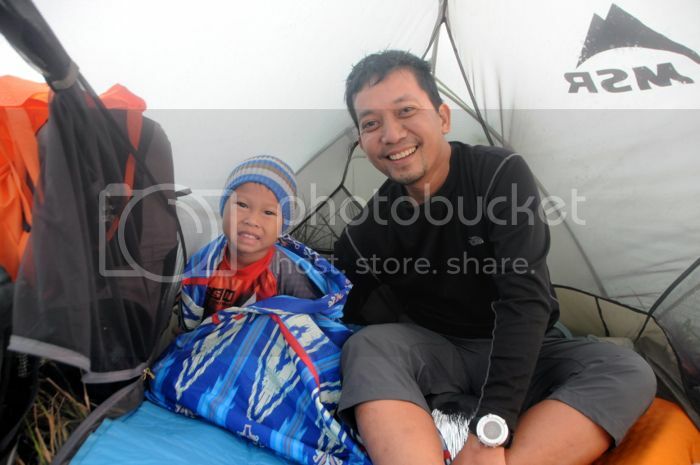 tadpole is a tent model specific to the north face. when they decided to add an extra pole to increase the vestibule space, they very cheekily called the model the TNF bullfrog. the term may mean two things in the context of philippine backpacking: 1) it is the act of loading oneself on the roof of a jeepney or any other public conveyance; or 2) the top pocket of a hiking backpack. with the first, which is commonly used as a verb ("masikip na ba sa loob? sige, mag-topload na lang ako"), i have no quarrel. the second usage, however, is wrong. i made a casual survey of the websites of top manufacturers of hiking and mountaineering backpacks, and one thing is consistent: none of them refer to that part of the bag as topload. instead, they use either of two terms: top pocket, or top lid. the misuse comes from the fact that in this country, we only have one type of pack in common use: top-loading hiking backpacks, where access is usually restricted to an opening located at the top. this is used to distinguish this pack from other means of accessing load. some bags allow for front-loading, while certain models of hiking packs also have side or panel access. top-loading backpacks are recommended here because we tend to use plastic bags as a means of waterproofing the contents of our bags, so having zippers on the side to access the main compartment doesn't make any sense. it is important to draw this distinction since the compound word does not refer to a receptacle or a part of the pack, but to its contents: the load that's on top. bag manufacturers differ on the top lid design: some float while others are fixed. some top pockets are actually removable and others may be converted into fanny packs. so the next time someone asks you if you have some trail food, tell them to get it from your bag's top pocket. just to be precise. 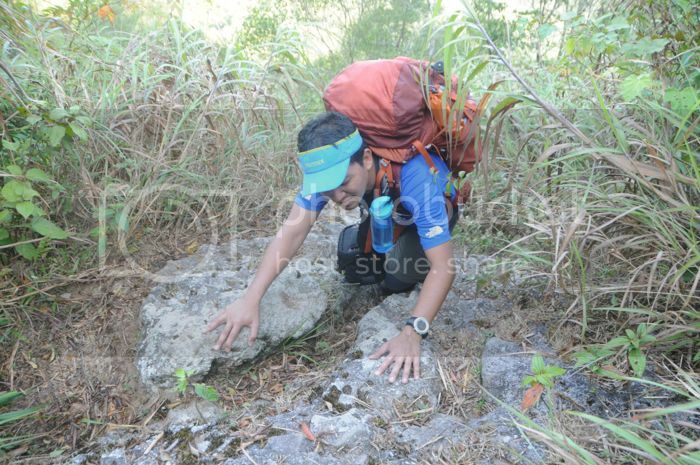 hiker A: tingnan mo yung bagong thermarest ko, murang-mura lang. 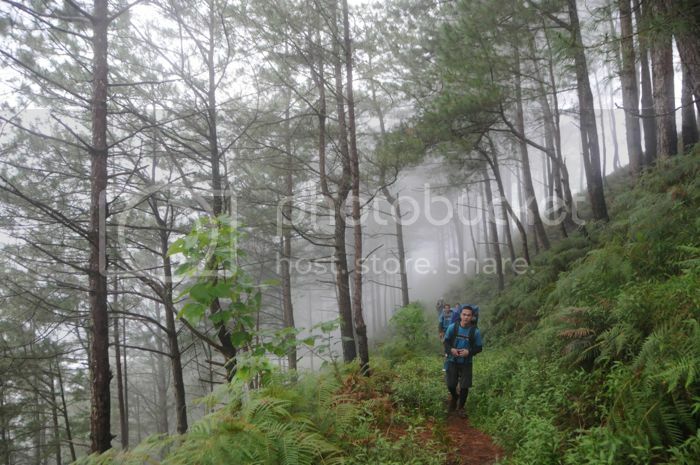 hiker B: talaga? anong tatak nyan? hiker A: adisi. pinabili ko sa taiwan. therm-a-rest is a brand that makes inflatable backpacking mattresses. it is not a type of gear. a lot of companies make inflatable mattresses, such as big agnes, sea to summit, REI, etc. the misuse here is the same as some decades ago, when colgate transformed from proper noun to noun, used by filipinos to refer to the generic item also known as toothpaste. (this is not the same as the misappropriation of tadpole, since in that case, it's the model, not the brand, that's being misused.) but that's hardly the case now, and people are more precise with their choices, so i don't see why this should become the norm. another term that may fall under the same category is "gore-tex", which some people think is the generic term for waterproof fabric. if at any time you're down on all fours, then the trail's technical. or is it? we do not have a proper, broadly-recognized classification and rating of trails. instead, we have general descriptions of trail characteristics. as a result, pinoy mountaineers throw around the word "technical" to refer to routes that would require some "technical skills". by that they mean rock scrambling, bouldering, crawling over and under obstacles, steep ascents that might require hikers to be on all fours (referred to as "4x4", which i think isn't necessarily an example of wrong usage, but a playful appropriation), and all other means of getting from one point to another that does not involve just plain walking. once again, the use of technical is pretty loose and imprecise, as the perception of what requires technique may be different from one person and the next. but since our use of "mountaineering" is restricted mostly to hiking or trekking, and exclude such activities as rock climbing, we ignore one simple thing: that in most cases, even in the most "technical" trail, there is hardly any need for technical equipment. so i am inclined to avoid the use of this word, unless in my next outing the trail requires me to bring abseiling ropes, harnesses, ice axes, or head protection. i do not make any urgent call to stop the misuse of some of these words. i don't even think that our loose usage is an indication of some kind of failure on our part as participants in a sub-culture. as one of my captions above suggests, our understanding of certain things may be different from the rest of the global community precisely because of context. but in my examples above, it is not relativity that's at issue. instead it's laziness. i would only like to draw everyone's attention on the fact that in this little world of climbers, hikers, backpackers, and yes, mountaineers, the distinct language we share isn't as ill-defined as we tend to think; we cannot go about re-defining terms that already have fixed meanings, and it pays to be aware since precision is its own reward. 1. Go to the UIAA site and download the main document on the Plurality of Mountaineering- it defines what are considered as mountaineering activities and one of that is Hiking. 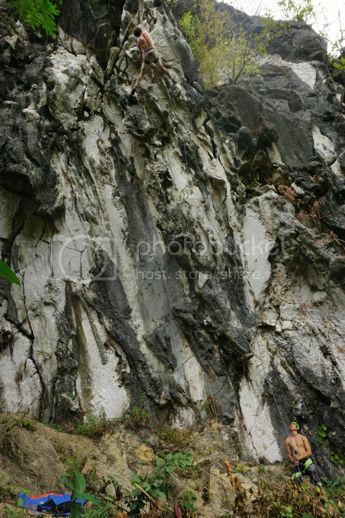 (and by the way you might get shocked to hear from me that indoor wall climbing is a classification of mountaineering). 2. Before you conclude on the quality of BMS, make sure you attended first at least the main one before you conclude that the courses was given based only on the experience of the lecturer and no research involved (point 1 is an example of research to clarify the terminologies related to the sport of climbing mountains). 3. Yes there are tadpole type tents defined by the manufacturers themselves. 4. Them-a-rest is like Colgate- other countries has such generic slangs so loosen up. It does not mean we are a lesser type on human for having our own pop culture- terminologies. 5. All other mountain classification are all subjective. Since we have a different kind of activity, its ok for us to create our own classification. We dont need to always immitate other countries especially if we would like to get out of our mold as third world country. I think, proper capitalization comes first before censuring the terms used by others. Merriam-Webster defines technical as "of or relating to technique". It further defines technique as "the manner in which technical details are treated (as by a writer) or basic physical movements are used (as by a dancer [or in this case a trekker]); also : ability to treat such details or use such movements"